We also had good results making Frozen Raspberry Lemonade Ice pops. We picked lemons off a tree in our backyard which adds an extra element of discovery for children. Fit a fine mesh strainer over a large bowl or measuring cup. Cut lemons in half and using a hand held reamer squeeze the lemons over the strainer (which will catch the seeds and pulp). You should have about 1c of juice. Discard pulp and seeds and rinse strainer. 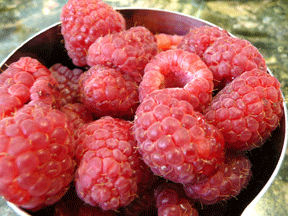 Dump the raspberries into the strainer and press through, mashing them with the back of a spoon or a firm spatula. Pour about 20oz of the water in 5oz passes over the seeds and pulp which will force more of the raspberry through the strainer. Discard remaining solids and seeds. 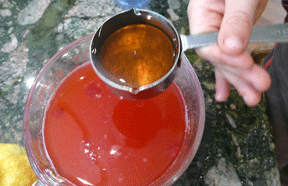 Add sugar syrup to taste and remaining water (you may need more or less syrup depending on the tartness of the fruit). We like lemonade lightly sweetened. Options: Just substitute different fruit to make different lemonades, such as strawberries, blackberries or blueberries. Add fresh mint leaves to garnish.